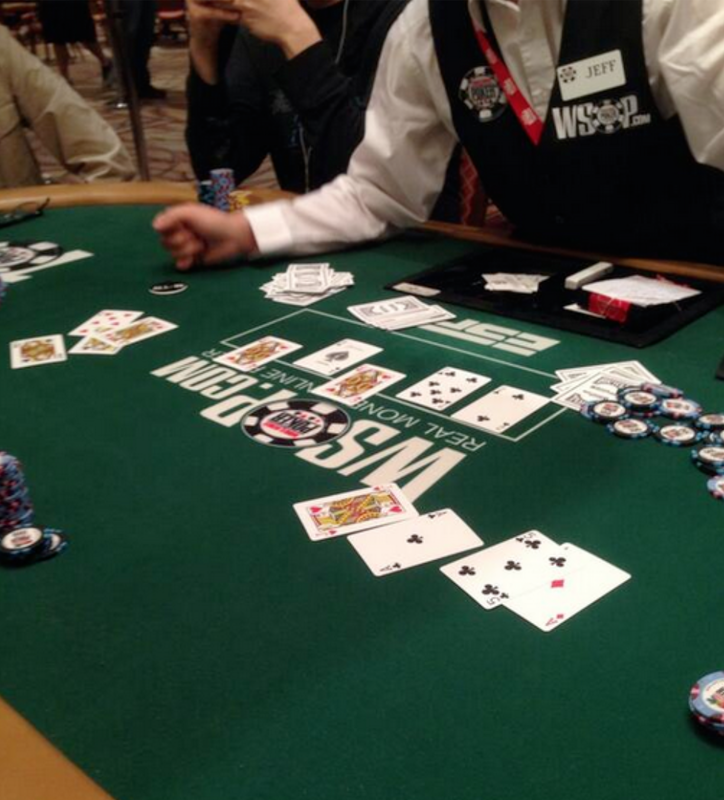 Kind of an odd one from the WSOP yesterday. You might have heard about this. Over in Event No. 37, the $1,500 pot-limit Omaha event, a player busted after dinner in one of those hands that was unique enough he felt inspired to snap a photo (pictured at left, click to embiggen). After getting to the turn with the board showing , the player got all of his chips in the middle holding for top set plus the nut flush draw against an opponent holding for the second-best set. Alas for the all-in player, a queen fell on the river to give his opponent quads, thus knocking out the player just shy of the money, and he took the picture just before departing. Indeed, the one-outer was remarkable enough to inspire the player to post his picture on Facebook, then a friend looking closely at the picture discovered something to make the beat even worse. That last queen... was the ! Just like the one that had fallen on the flop. A fouled deck had produced a duplicate card, and the player ended up getting in touch with WSOP staff to see about possibly being refunded his buy-in. The pic is a little blurry - couldn't that last card be a diamond, not a heart? That's what some of the amateur forensics experts in the 2+2 thread have said, too, but apparently they've concluded it is a second Qh.